President Obama joined civil rights leaders to open the newest Smithsonian Saturday, ringing a historic bell as the museum opened. Timed entry passes for the opening weekend are no longer available, but visitors can enjoy a free music festival without tickets. Be prepared for road closures, large crowds and heightened security in the area surrounding the National Mall. "Phenomenal." "Hopeful." "Exhilarating." 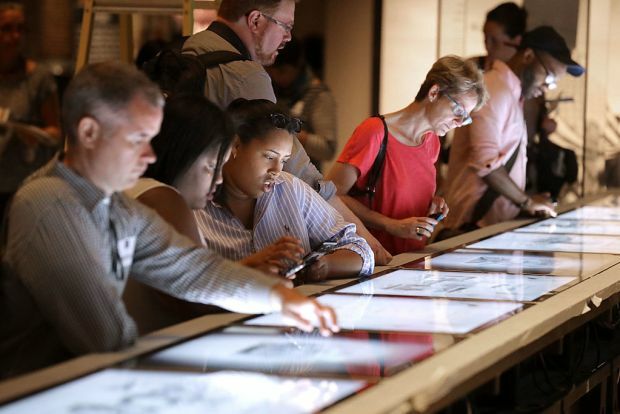 Visitors were enthralled by their trips through the new National Museum of African American History and Culture on its opening day, describing the experience as inspiring, cathartic and phenomenal -- a word that came up again and again. Crowds lined up early for the new African American History Museum's 2nd day. Visitors shared what they were most looking forward to seeing. New groups of eager visitors are lining up outside the newest Smithsonian on Sunday, sharing their thoughts on what they're most looking forward to seeing now that Washington, D.C.'s highly anticipated black history museum has opened its doors after more than 100 years in the making. "I think just being able to look at all the African American history in one set location, looking at Prince's jacket, Chuck Berry's Cadillac; I'm just excited about the whole thing," said Jennifer Kirby, who traveled with her family from Atlanta. "I'm just going to say Emmett Till's original casket, because I lived through that era," said visitor Vivian Favors. With thousands of items occupying 85,000 square feet of exhibition space, the new Smithsonian is chronicling the complex relationship between the United States and a people it once enslaved, and telling the story of those who worked to make the necessary changes to bring the country to where it is today. Alexis Lennon, of Takoma Park, said she thought the museum did an "amazing job of telling our story." "It was life-changing for me to finally have a place that embodies African American culture," she said Sunday. Lifelong D.C resident Denise Evans said she jumped at the opportunity to visit the museum when a friend who couldn't make it offered her a ticket Sunday morning. Evans, 49, said the museum was "sort of heartbreaking," but also interesting and uplifting. "Unfortunately so many things are repeating itself and so it was a little bit heartbreaking to see that as far as we've come we are beginning to repeat those same patterns of discrimination," Evans said. "But I think because we can see the path from it then we can sort of being ourselves out of it again." Her favorite exhibit highlighted African American fashion. "Just really being able to see that we have our own style, that we can own who we are and that we really do have an impact on much of what the whole does... so much of that has been quieted, and so seeing it on display it's like, 'OK, right, we are pretty cool and we are creative and we are gifted,'" she said. The museum is offering extended hours for its grand opening weekend. Sunday, the museum will stay open from 7 a.m. to midnight, but passes were snapped up almost as soon as they became available. Although admission is free, the museum is using a timed pass system to control crowds and alleviate wait times. Despite the lengthy lines both outside and inside the museum, visitors said the timed entry pass system is efficient, keeping wait times down. However, anyone heading toward the museum this weekend should be prepared for large crowds and heightened security. 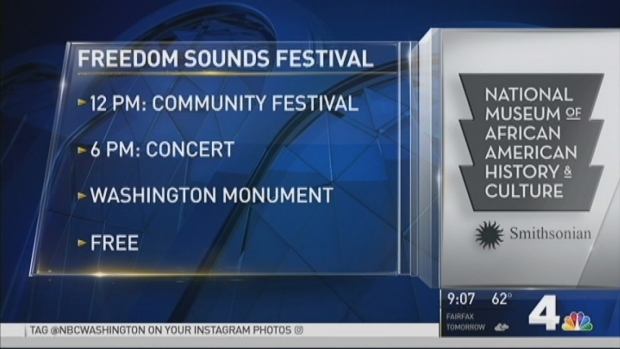 The museum's outdoor music festival is open to the public on the Washington Monument grounds, with no tickets required. The festival, Freedom Sounds, is celebrating the talent and creativity of African-American artists, with jazz, R&B, gospel and hip-hop artists throughout the weekend. The Roots, Living Colour and Public Enemy headlined Saturday night. Performances continue throughout the day Sunday, with another main-stage concert scheduled for 6 to 9 p.m. A surprise special guest is slated to perform. Dr. Greg Carr, associate professor and chair of the department of Afro-American Studies at Howard University, discusses the the significance of the museum and what can people expect when they walk in. Lennon and Andres Rossy toured the museum for more than three hours Sunday, but said they would need much more time to see everything inside. "You definitely can't do it all in one day," said Rossy, of Takoma Park. "So we'll be back, but I had a great time." Margaret Baxter and her husband drove up from their home in Durham, North Carolina to visit the museum with Margaret's 71-year-old grandmother. As a fan of history, Baxter said she enjoyed the exhibits on slavery and segregation in America. "It would probably take you two to three days to see every single thing, but it's so well put together," she said. "It's incredible." Her grandmother, D.C. resident Marthena Baxter, said she enjoyed seeing the exhibits highlighting "entertainers from back when," like Chuck Berry, Barry White and James Brown. Marthena Baxter said she plans on returning to the museum after crowds die down to "really take everything in." "The whole place was amazing, absolutely amazing," she said. "I will be back." 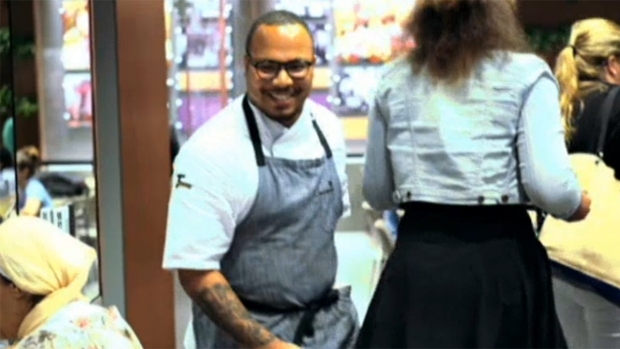 Go inside the National Museum of African American History and Culture’s Sweet Home Café with Executive Chef Jerome Grant. Saturday's Dedication Ceremony: "By Understanding this Story, It Binds Us Together"
Centuries of struggles and strife, decades of planning and pain, and years of hoping for a place that African-American history can call home culminated Saturday morning as President Barack Obama officially dedicated the museum. Obama opened the museum Saturday with the ringing of the historic Freedom Bell from the First Baptist Church in Williamsburg, Virginia, which was organized in 1776 by slaves. Obama said the new national museum will help to tell a richer and fuller story of the country. "It helps us better understand the lives, yes, of a president, but also the slave. The industrialist, but also the worker. The teacher or the cook, alongside the story of the statesman," he said. "By understanding this story, it binds us together and reaffirms we are all Americans." 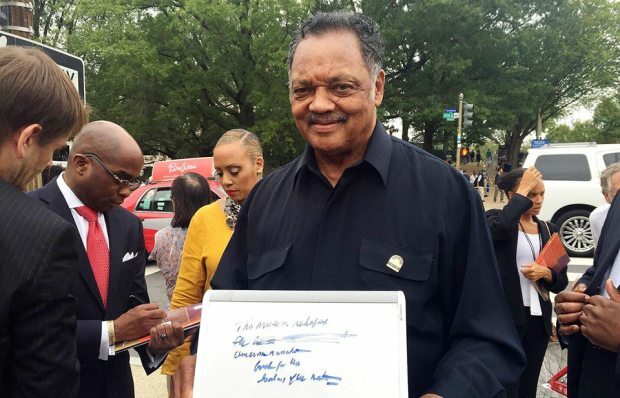 He continued his message of the inclusion of African Americans in American history, calling it "an act of patriotism to understand where we've been." "We're not a burden on America or a stain on America or an object of shame and pity for America. We are America. And that's what this museum explains," Obama said. "Hopefully, this museum makes us talk to each other and listen to each other and see each other." The dedication featured speeches by Obama, civil rights leader U.S. Rep. John Lewis, former President George W. Bush and the museum's founding director, Lonnie Bunch. It also featured rousing musical tributes with a local flair, including Howard University's "Showtime" marching band and an a capella presentation by a choir from D.C.'s Duke Ellington School for the Arts. The museum, the 19th and newest of the Smithsonians, opened to the public following the dedication ceremony. "It's a historic event," said Leslie Howard, who traveled from New Orleans to attend the dedication. "And the fact that we have our first black president to dedicate it shows you how God works." 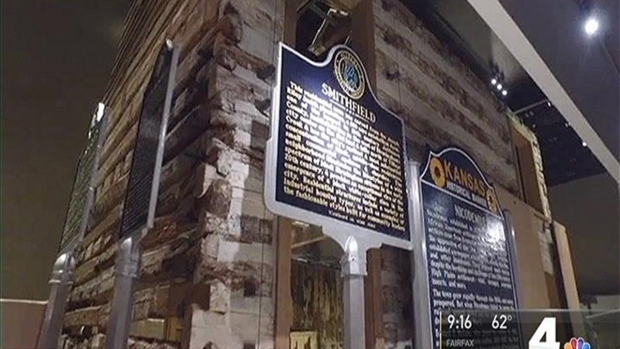 "We want to make sure we reinforce the commitment to preserve African-American history," said Glen Yonkers, Jr., a member of Omega Psi Phi Fraternity, which was founded at Howard University in Washington. Members marched to the mall for the dedication Saturday. "Our fraternity was built for African-American men to have a place to share our history and stories," said fraternity brother Jude Collins. "This was the only place to be today." Seeing the dedication was a family event for many; Alicia Frayer came from Charleston with her husband and three daughters to attend. "I'm inspired by history," she said. "It's a major part of our history, and the fact that our history and culture are here for everyone to see is so important." Many celebrities came to the museum's dedication as well, including Oprah Winfrey, who has donated more then $20 million to the museum. The museum tweeted a video of Octavia Spencer and Janelle Monae arriving. Robert De Niro, Angela Bassett, Will Smith and Patti LaBelle were among those presenting during the dedication. Lexie Schapitl contributed to this report. For more information about the museum, check NBC Washington's full coverage here.